SpaceX CEO Elon Musk hasn’t gotten much sleep this weekend. But true to form, he’s already dreaming of something far more ambitious. The private space company has achieved a lot within the last 48 hours. Their futuristic passenger spacecraft Crew Dragon launched early Saturday morning from the Kennedy Space Center and successfully docked autonomously with the International Space Station some 26 hours later. If all goes well, two astronauts will fly on board the spacecraft to the ISS as soon as July. Earlier this year, Musk admitted that he wanted to get to the Moon – and “as fast as possible,” he wrote in a Jan 31 tweet. The vehicle that could fulfill that dream: the stainless-steel monstrosity dubbed Starship. But getting Starship to the Moon will be a much harder feat to pull off than any NASA project ever. 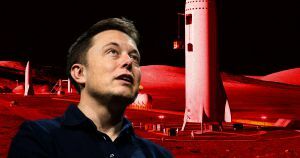 “It won’t be easy for us or SpaceX,” Walt Engelund, director of Space Technology and Exploration Directorate at NASA, told Business Insider in a February interview. But one step at a time. “We’ve got to focus on getting [the Crew Dragon missions] right, for sure. That’s the priority,” Musk admitted at Saturday’s press event. The post Elon Musk Wants to Build a “Permanently Occupied Human Base” on the Moon appeared first on Futurism.